Douglas Laing’s original Scallywag launched in November 2013 with resounding success. 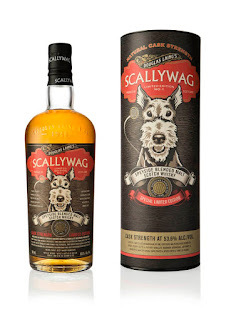 They now reveal its super-powered partner in crime: Scallywag Cask Strength. At 53.6% ABV, it’s a particularly complex, powerful Speyside whisky that heightens the richly spiced character of the original “top dog”. This limited edition bottling is created using only legendary Speyside malts including, amongst others, Mortlach, Macallan and Glenrothes, and only 1,000 cases are available globally. The unique packaging features a rather startled Scallywag, his ears pricked and his monocle blasted off having just experienced his cask strength namesake. Cask Strength Scallywag has a rich, dark colour, extracted from many carefully selected sherry butts. It carries a richly spiced character on the nose woven through with delicious vanilla from the ex-bourbon casks. On the big, chewy palate you'll detect layers of dark chocolate, more vanilla and sweet stewed fruit fused with nutmeg and cinnamon and treacle. Most of these flavours can be attributed to quite some years slumbering in sherry butts. The finish displays a burst of zesty orange with sweet tobacco, cocoa rich fruit cake.